We stayed at that beautiful right point for two days before we decided to make a run for some warmer water. 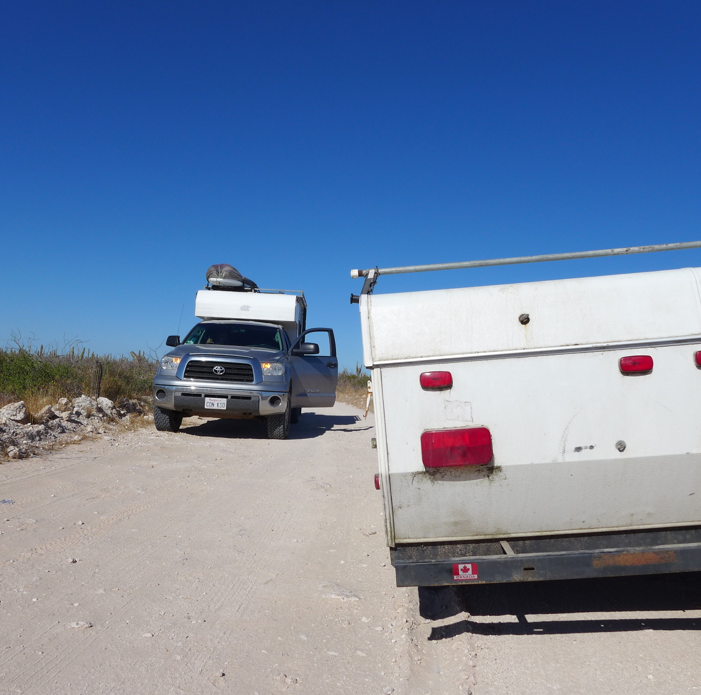 CON KSO packs up quickly so we broke camp and made a dash south. At Bahia Concepcion, on the Sea of Cortez, we ran out of steam and daylight. I'm not a fan of running the Baja highway at night, when shadows in the road might actually be a thousand pounds of steer flesh, a living tope (spanish word for speedbump) that could kill you. So it was here that the Fellowship of the Surf broke up, we pulled into a little hidey hole/campsite and the boys powered through the night. 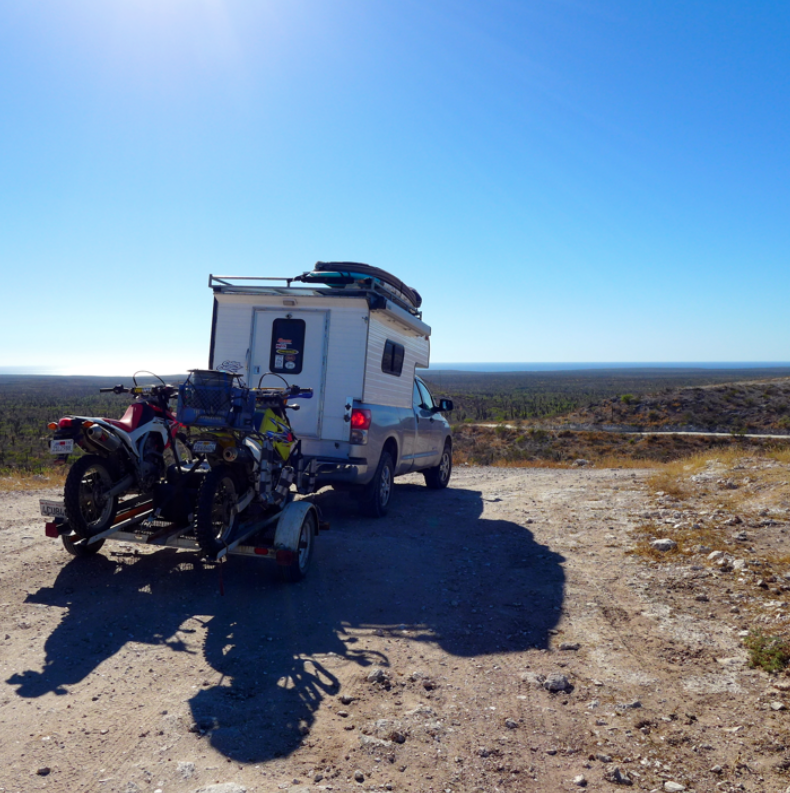 The next morning we hit the road and in a few hours we arrived at the road to my favorite wave in Baja. The gateway to a beautiful left point; goofy footers dream. 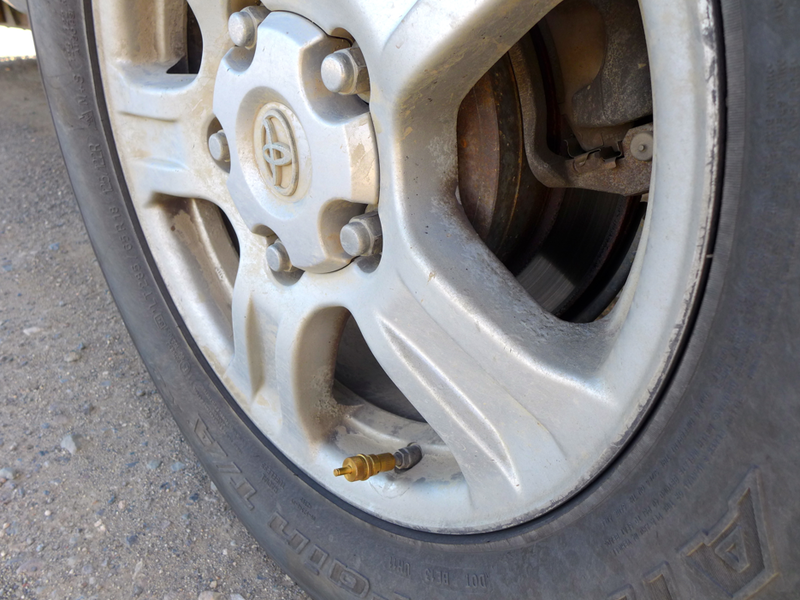 Once again, when facing a torture-road, air down your tires. I bought these Staun deflators before the trip and I'm a huge fan of them. Instead of squatting down with a little twig or rock and spending twenty minutes dropping the pressure in all four BFGs you can screw these on each wheel, walk away and it's over in five minutes. Halfway into the surfspot we came across something abandoned on the road by our gentle, northern neighbors. A broken axle. 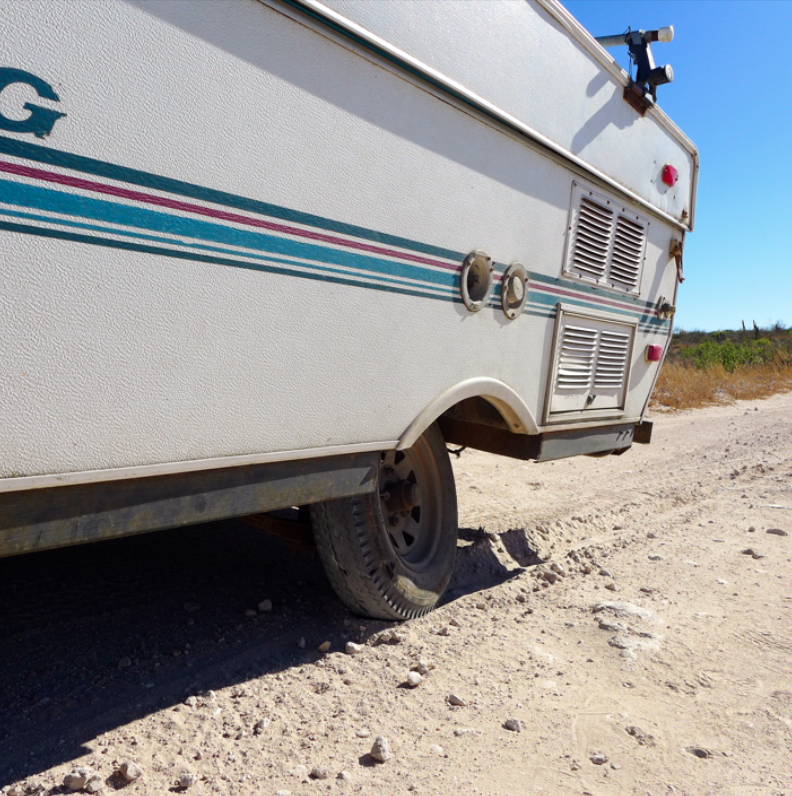 This camper was meant to live at the weekend KOA campground now it will rot and rust in the Baja sun, another gringo discard in the beautiful desert. Air down, save your axles. By the way, the trailer had a set of propane bottles and a battery box on it when we went past- the next day it was stripped bare. Before surfing, I brought the girls down to the bottom of the point. The water was warm, the beach was sandy- and we should have known this would happen. Bang, stingray hit! 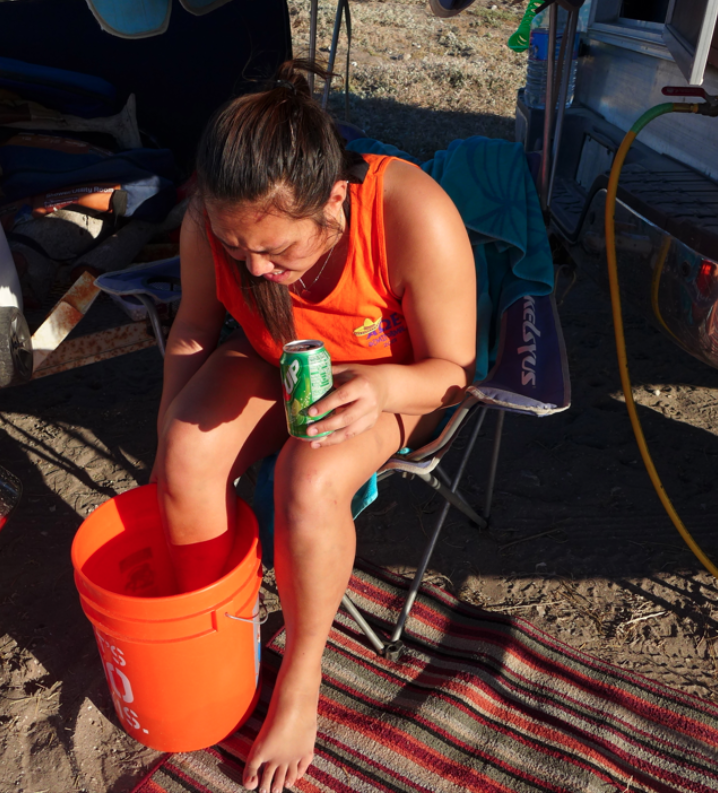 Poor Kotah, she got hit the instant the water was deeper than her ankle. Evidently, after talking to some friends at the point, the beach was carpeted with the little beasties- three people in their camp had been hit. Ouch. I got some water heated up on CON KSO's stove and we stewed her foot in the hot water. 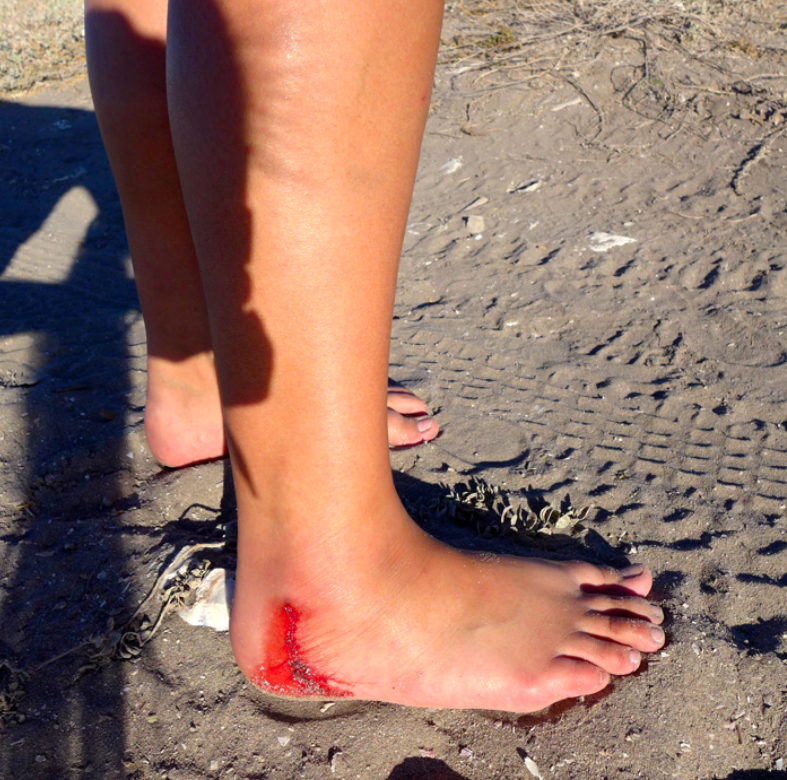 This hurts- both the hot water and the rhythmic tsunami surges of pain that come from the stingray venom. Kotah took it like a champ. Kotah rebounded after an hour or so and decided to recuperate on CON KSO's upper deck, The Aloha Deck. It was a beautiful evening, clear and warm. It was going to be a perfect night for Santa to navigate his stealth-sleigh around the globe. I built a fire that burned hot and fragrant and after the girls went to sleep, I cracked the first beer of the six that I would drink that night (thank you surf-neighbor Joules for those Christmas beers), stared into the fire and thought about my life. I think Herbie Fletcher said, "Life's a trip, pack your bags". I thought those words did a great job of summing up my current cosmic station. I was content, it was a good time to be. 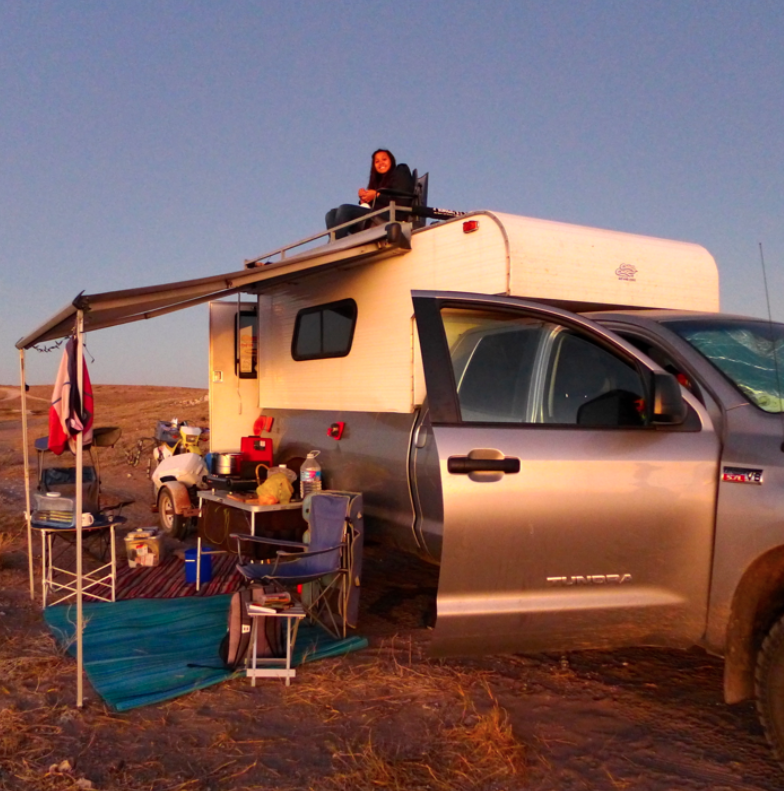 I'm not sure what time I pulled the ripcord and crawled into CON KSO's comfy camper but it was Christmas Eve and I was ready to wake up to whatever surf-Santa might decide to bring me. Little did I know that I had been on his "Nice" list because the next morning was a great one.